"A powerful scientific framework, grounded in evolutionary biology, that helps us think about leadership successes and failures throughout history and how we might address humanity's need for better leadership going forward." "Brilliant insights—straightforward, easy to comprehend, and extremely useful to anyone in business. I predict the four-drives model will replace Maslow's hierarchy of needs as the accepted way of describing human behavior." "Paul Lawrence is back! Driven to Lead is the most comprehensive general theory of leadership ever created. By digging deeply into Darwin, Lawrence offers a practical guide for authentic leaders to excel in today's challenging world." "If Darwin had written a book about leadership in the twenty-first century, this would be it." "It's the E = mc2 of human behavior." 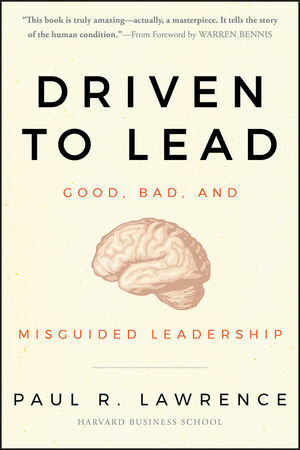 "This book presents a rigorous and novel theory on how evolution and the human brain can produce effective and ineffective leadership. The writing is clear. It is accessible to practitioners as well as to researchers." Paul R. Lawrence is the Wallace Brett Donham Professor of Organizational Behavior Emeritus at Harvard Business School. He is the author of twenty-five books and numerous articles across the entire field of social sciences and is the coauthor, with Nitin Nohria, of Driven: How Human Nature Shapes Our Choices. 1 How Much Can We Hope For? PART ONE: THE LEADERSHIP BRAIN. 2 A Brain Designed for Leadership? 3 Darwin Rediscovered: Did the Brain Evolve Leadership Capabilities? PART TWO: HISTORIC LEADERSHIP PATTERNS. 4 All About Leaders: Good, Bad, and Misguided. 5 Leadership and the Historic Evolution of Political Institutions. 6 Leadership of Economic Institutions: The Rise of Corporations. 7 Leadership in Institutions of Human Meaning: Religion, Art, and Science. PART THREE: LEADERSHIP IN CONTEMPORARY AFFAIRS. 8 Keeping on Track: Leadership in Contemporary Corporations. 9 A Worldwide Swindle: By Banking Leaders-w/o-Conscience? 10 Keeping a Global Economy and a Global Community on Track. 11 Keeping on Track by Practicing Good/Moral Leadership. 12 Renewing the Story of Human Progress with Darwin's Help.